The 2017 Acura TLX is a midsize luxury sedan that excels in technology, interior comfort, and convenience features. But we’re not the only ones who think so – top automotive critics are taking notice as well. In terms of tech, Motor Trend lauds its technology offerings. Edmunds likes it’s “quiet cabin at highway speeds,” while U.S. News labels its seating “extremely comfortable.” To learn more about this exciting vehicle, visit us at Acura of Denville for a test drive today! 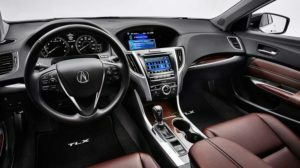 Acura models typically come out ahead in technology, and that definitely rings true for the 2017 TLX. As Motor Trend put it, “the TLX feels like a good compromise between the TL and TSX and is vastly improved over both of those cars in terms of available technology.” Standard technology includes Bluetooth®, Siri® Eyes Free, the Keyless Access System, and more. While the TLX has a host of standard tech offerings, you can also upgrade to the Technology Package for the likes of a Navigation System, 10-speaker ELS Studio® Premium Audio System, Forward Collision Warning, Lane Keeping Assist, among other features. Edmunds raves that “the front seats in the TLX have thick, supple padding… creating a sporty yet cushy feel. The rear seat is quite plush, too.” You’ll be able to relax and get comfortable in the TLX without having to worry about an excess of highway noise. U.S. News also enjoys its “well-designed interior,” which “doesn’t skimp on quality” despite coming in at close to the lowest price point in its class.” The front seats have ample space, and the rear seats are accommodating as well. U.S. News also notes its long list of standard convenience features, which includes a power moonroof, a dual-screen infotainment system, smartphone app integration, voice command activation, and more. Now It’s Time to Test Out the TLX Yourself! You’ve heard what the critics had to say, so now it’s time for you to form your own opinion. To take the 2017 Acura TLX for a spin, simply visit us at 3109 Rt. 10 East in Denville, NJ. Our sales staff will set you up with a TLX model that suits your driving style as well as your budget. Want to know more before coming to the dealership? Contact us at your convenience, then come by to finance an Acura today!